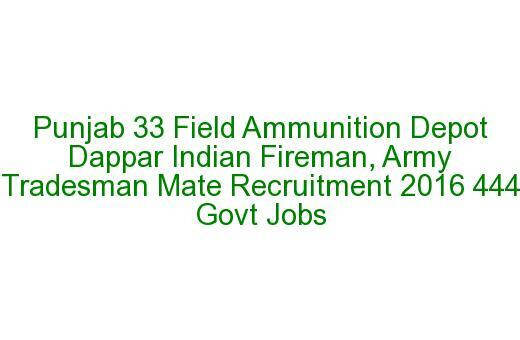 vacancies available in current recruitment of Punjab Indian Army 33 FAD Dappar. 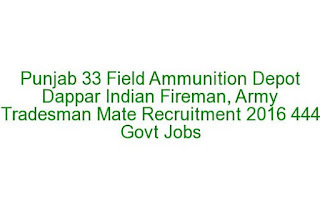 The candidates who are willing to serve for Indian Army they can apply for these posts through a specific format and filled application to be reach to Recruitment Cell, 33 Field Ammunition Depot, PIN – 900241 c/o 56 APO within 21 days from the notification date in Employment News. For more information regarding this 33 FIELD AMMUNITION DEPOT Dappar recruitment please see the data given below. àFor fireman posts matriculation/10th pass is required. àPainter post matriculation/10th pass required and (a) Certificate in the trade from a recognized ITI or 3 years training and/or experience of actual work in the trade. (b) Tests specified by Board of Officer including Physical Test & Skill Test. 33 FAD Recruitment will be held in two stages. Physical Measurements test and written test will be conducted. (i) Run 1.6 KM in 6 Mins. Candidates finishing after 6 Mins will be rejected for further tests. (ii) Carrying a man (fireman lift ) of 63.5 Kgs to a distance of 183 meters within 96 seconds. Candidates not passing will not be allowed to take further tests. (iii) Clearing 2.7 meters wide ditch & landing on both feet (long jump). Candidates not passing will not be allowed to take further tests. (iv) Climbing 3 meters vertical rope using hands and feet. Candidates not passing will not be allowed to take further tests. (i) 1.5 KM run in 4.5 Mins. Candidates finishing after 4.5 Mins will be rejected for further tests. For all the posts Should pass written test. No interview will be held. Syllabus will be in Matriculation Standard Only. filling the form neatly attach the attested copies of educational qualifications, Date of Birth, Caste Certificate, Sports or NCC and other required documents and send to the respective Indian army recruitment center of 33 FIELD AMMUNITION DEPOT Dappar, Punjab through Ordinary Post/Speed Post/Registered Post. On cover letter must have write "Application For the Posts of-----------------"For more details please see the official notification or information. Self addressed envelope affixing postal Stamp of `. 25/-. to be attached with the application form. I too got my admit card.i need some help .Iam alone ..I am from andhrapradesh.